Much muttering and cries of “unprecedeted” from the alarmists about Russia’s 2010 heatwave and the resulting forest fires. The years of 1839-1841 were known as the “hungry years”. In the spring of 1840, the spring sowings of corn disappeared in many places. From midway through April until the end of August not a drop of rain fell. From the beginning of summer the fields were covered with a dirty grey film of dust. All the plants wilted, dying from the heat and lack of water. It was extraordinarily hot and close, even though the sun, being covered in haze, shone very weakly through the haze of smoke. Here and there in various regions of Russia the forests and peat bogs were burning (the firest had begun already in 1839). there was a reddish haze, partially covering the sun, and there were dark, menacing clouds on the horizon. There was a choking stench of smoke which penetrated everywhere, even into houses where the windows remained closed. Other chronicles I’ve found in the past (and lost the links) catalogue deep cold events in various parts of continental Europe. Do readers have any more? Does this have any relation with M.Vukcevick “Y “north magnetic dipole(*)? Where the NMP has divided in two, one over Russia. His LOD/GMF relation also would indicate a relation to gravity (as LOD relates to it). TB: yes there is a great deal in the human record, if as you realise some caution is needed. Seems to me that continental climate has extremes which is of course exactly what is seen, maritime it isn’t. A question is perhaps: and what do the infamous trees say about this, the dendro brigade? Fire damage ought to be easy to find but heat/water perhaps a wee bit more difficult. Tim, yes, big continental masses build big stable weather patterns which persist for weeks or even months. One of the reasons weather is such a popular topic in Britain is because o-one knows what will happen tomorrow. I would think surviving trees in burnt ares will have growth spurts due to the nutrition of the soil and increased light availability. Higher local temperature from absorption by darker soil too. I’m not well versed in dendro literature so I can’t help with what they have to say. Meanwhile, welcome to your own second Little Ice Age. 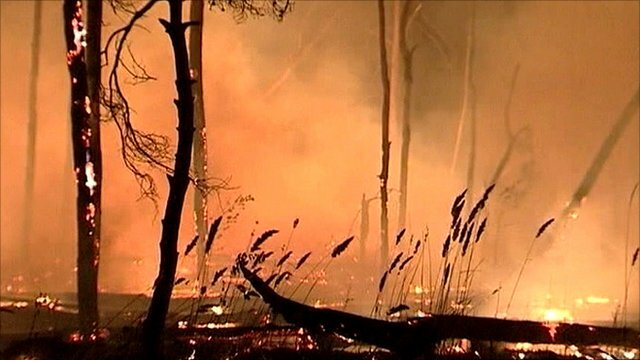 In the South Eastern corner of Australia we are quite used to forest fires occurring every few years. These were a feature of natural variability for many thousands of years before European settlement of the continent. In our case they are usually linked to hot and dry seasons, mainly influenced by strong El Nino patterns. At the moment we are having the opposite, our wettest and coolest spring for many years across the whole of eastern Australia, mostly caused by a strong La Nina. There should be no surprise that hot and dry periods can occur in Russia, and no reason to blame them on AGW. In ‘Ice Age Terminations’ by Cheng et. al. (Science Vol 326, 9Oct. 2009), the authors established a very convincing correspondence between a weak Monsoon (WM) in SE Asia and the retreat of the NH ice sheets. The connection between El Nino/La Nina and the SE Monsoon was established many decades ago, and one wonders if there could be a long chain of teleconnections linking the La Nina through the SE Asian Monsoon (which devastated Indian sub-continent earlier in the year), to drying weather patterns over central and eastern Russia and cooler weather over the East Atlantic. yes, the more responsible among the warmista recognized that this is weather not climate. Didn’t stop the alarmists from singing the usual dirge and lament though. Now you need to find “La Niña”´s father. Just in name of Mayeutics…..
A.D. 1194. A.M. 6702. The same year Ladoga took fire before Novgorod, and then, too, Russa took fire; and in the Lyudin end ten courts took fire; and thus wonders continued from All Saints up to Our Lady’s Day. And then came the rest of the living from the Yugra country. AD. 1201. A.M. 6709. On April 15 of the same year the church of St. Nikola in the Gorodishche’ was burnt down by thunder; and the whole summer stood with rain. A.D. 1335. A.M. 6843. The same year, for our sins, there were great fires in Russia; Moscow. Vologda, Vitebsk were burnt, and Yurev [Reval/Tallinn] of the Nemtsy [Germans] was entirely burnt down. A.D. 1337. A.M. 6845. The same year the whole of Moscow was burnt down; and then there came heavy rain and flooded everything; both in the cellars and in the squares wherever anything had been carried out. The same year Toropets was burnt down and flooded. A.D. 1028. A.M. 6536.There appeared a sign in the sky like a serpent. A.D. 1065. A.M. 6573. and in the west there appeared a great star. A.D. 1141. A.M. 6649. On April 1 there was a very marvellous sign in the sky; six circles, three close about the sun, and three other large ones outside the sun, and stood nearly all day. I began to read the Novgorod Chronicle only for mention of unusual climate events following Tallbloke’s post above. It is not beyond the realm of possibilities that in the Novgorod Chronicle, which makes frequent mention of the activities of the tribes of Chud, in particular from the west of Lake Chudskoe (Peipsi), that I am reading about my genetic ancestors! I would expect 1831 to be similar to 2010. I saw one of those back in the 1970s, a fire breathing dragon, nearly 100 miles long. Such an interesting word is bolide. I seem to remember that although a lot of trees got knocked down at Tunguska, no-one found a crater. Was that because it was swampy ground? Someone here (Ulric?) suggested it might have been an electrical event rather than gravitational. The felled tree images are famous and show something very strange happened. To date neither fragments of the bolide, nor impact craters have ever been identified in the Tunguska area. One small bog was eventually drained and yielded only a tree stump. The Electric Universe people in 2006 discussed whether it could have been electric discharge. It is well worth the read for other strange anomalies prior to the event eg, strange weather, sounds, glowing skies, seismic activity and geomagnetic effects as well as a global atmospheric pressure pulse which seem to suggest electric force being involved. The Italian Tunguska research team from the University of Bologna, who after several expeditions, are hopeful of finding evidence at the bottom of the 164 deep Lake Cheko about 8 km NW of the explosion epicentre. They claim there is some evidence that the lake formed only in 1908. The lake has an unusual funnel shape. They may be presenting research results at an International Conference on Tunguska and Asteroid/Comet Impacts in Bucharest in May 2011. There is news from NASA of the first ever tracked during entry, asteroid that in October 2008, crashed into the Nubian Desert in Sudan. And then there’s the guy in Ukraine? who sold bits of meteorite which he claims fell on his house on several different occasions! I’ll read the EU piece with my best sceptical glasses on. A French satellite observed a dramatic increase in ultra low frequency radio waves over Haiti in the month before the M7.0 earthquake earlier this year. Blimey, that is an amazing result. Very interesting. I’ll post that in a day or so as a new thread. Thanks for the headsup. Just passing on what I followed through from a comment on Erik Klemetti’s ‘About Eruptions’ blog. This is great! Long history and short memories! Reminds me of the expression commonly used in Russian Annuls and Chronicles of people going and returning ‘with love’.